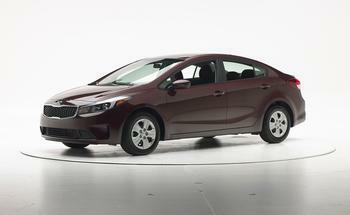 A stronger performance in the Insurance Institute for Highway Safety's (IIHS) small overlap front crash test has earned the 2017 Kia Forte the TOP SAFETY PICK+ award. Among the improvements in the vehicle are an optional, superior-rated front crash prevention system and available good-rated headlights. The vehicle has longer side-curtain airbags than earlier models, and Fortes built after March have beefed-up structure at the door hinge pillar and the door sill. Those changes gave Fortes built after March a good rating in the small overlap test, which represents a crash in which the left front corner of a vehicle collides with another vehicle or with an object such as a tree or utility pole. In the test, the driver's space was maintained well, with maximum intrusion of three inches at the footrest. The dummy's movement was well-controlled, and measures from the dummy indicated a low risk of injuries in a crash of this severity. Earlier models of the Forte earned a marginal rating, with intrusion reaching 8 inches at the lower hinge pillar. In addition, the dummy's head contacted the instrument panel, and the side curtain airbag failed to provide sufficient forward coverage. To qualify for the 2017 TOP SAFETY PICK award, a vehicle must have good ratings in the small overlap front, moderate overlap front, side, roof strength, and head restraint tests and an available front crash prevention rating that earns an advanced or superior rating. The "plus" is awarded to vehicles that meet those criteria and also have good or acceptable headlights.